Here’s the trailer for the game to warm things up. Okay, now that we’re psyched, you immediately get to choose your side: Loyalists or Traitors. As a fan of the Warmaster I picked the Traitors. The game then gets you through the tutorial where you follow several events that are part of the main quest. For the Traitors this is the pursuit of Saul Tarvitz of the Emperor’s Children who warned the Loyalists of Horus’ treachery across the game map. At the end of the tutorial (where a massive battle is showcased) you pick your legion and start out in earnest. You can change your chapter by spending Machine Spirit. You start out with the HQ and the main resource buildings, then start branching out. Obviously I have progressed quite a bit since launch, so no pics of the start here. Your fighting force starts out in Rally Zones, where you can recruit a variety of troops. The starting troops are the Space Marines, in time Terminators, Jetbikes, Devastator Squads and armored regiments also join your forces. In total you can unlock 8 zones to rally your troops. Aside from the mighty Contemptor Dreadnoughts you can enlist Predator and Glaive tanks as well as Raptor Gunships. Just like the other similar games of the genre you get two main resources, one of them more dependent on time to replenish: Power and Munitions. Power is used to build and upgrade buildings (including base defenses), whereas munitions are used to enlist troops, upgrading units and tactics through research and scouting new regions. These resources can be secured (partly) against raiders with the Vault. There’s also a 3rd resource called Machine Spirit, which is the inlet to the “freemium” feature of the game (game cash for real cash). It allows you to speed up building and upgrade times as well as enlisting more Mechanicum adepts to simultaneous base building and upgrades. So far I spent some Machine Spirit to acquire a second adept. Power comes from the 1 Power Generator you get in the beginning. As far as I have played, you don’t get additional generators. Munitions drops supply munitions and can be built in numbers as you advance in HQ levels. An additional source is the Tribute Monument that gets you additional munitions from conquered regions. Base building and calling in reinforcements is done through the bottom left turret icon and the rally zones respectively. You have only one opening in your base which is the bottom right corner, where enemy players drop in (hence the name Drop Assault!) and attack. The base map is littered with debris as well, where the player can spend power in return for munitions and clear them out. 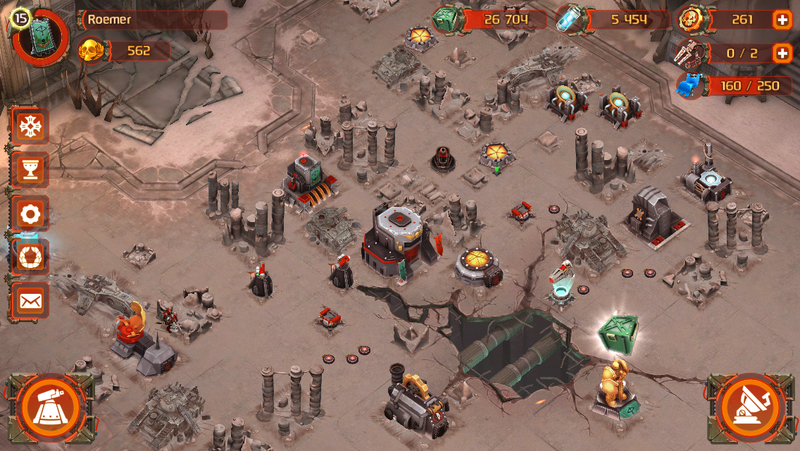 Combining the debris with your defenses (mines and turrets) can provide a good strategy against raiders. Rally Zones provide the recruitment options. You can always switch out units in return for more munitions, provided that you accept the munitions loss of the previous units. Entry to base. I guess I should really look into having a good defense to counteract attackers. Let’s take a look at the regional map. The strategic map shows outposts and enemy players as well as your control level on the region. Regardless of the initial choices in allegiance and chapter, you start out in the middle of the “phased out” regional map, surrounded by the fog of war and a choice of regions for you to explore by spending munitions. As scouting progresses, regional borders are explored and control of region becomes an issue to have additional resources. The Eye of Horus shows the level of control over the region. Controlling 75% or more on the region (amount of conquered outposts) provides a resource bonus per hour. Each dominated outpost provides additional munitions. Thus we can argue the game encourages being aggressive to loot munitions by conquering, upgrading troops and tactics and starting the cycle anew. Here’s the next step in my main quest, I have progressed to the second act of it. Pursuing Saul has not been easy! So far I have unlocked one PVP arena to pit your troops against a similar ranked enemy. The rest are either outpost battles to fight computer generated bases or attacking other players. The fog of war unveils as the Logistics building is upgraded and parts of the region are scouted out. I mentioned that the map is phased out. This is because the enemy players that show up in your strategic map can change as you defeat them or over time. If you allow them to remain, they can upgrade and become a nuisance to you, capturing your outposts. There’s also a PVP arena to battle players of a similar rank and level in a “capture the flag” type battle. I don’t have a lot of experience in that field as I met mainly high ranked enemies that slaughtered me, but being successful here and gaining rank allows you to get better chance at getting high tech shards to forge better Relics. So far I mentioned quite a few times about battling the players and the AI. But how does that work? You pick a spot to unleash your forces! Upon entering the tactical map through Recon or Attack (I recommend recon-ing first) you get the chance to survey the enemy. Turrets and mines in the entrance with supplies littered across the map. The ultimate aim is to destroy the HQ, here on the top left. All battles have a bonus victory condition, here it is losing less than 25% of the attacking forces. Achieving this gives you more resources. You get to see your available forces on the bottom left and after clicking attack, you get to see the tactics available to you according to your level. Your forces enter on the yellow zone. Battles last 5 minutes, if you cannot destroy the HQ before the deadline, you are defeated. 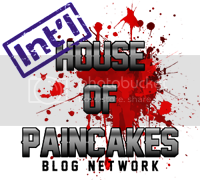 Here I bypassed the defenses to attach the HQ directly. Each chapter has a different approach to battle. As the Sons of Horus, I get to have more energy during battle to issue special tactics, displayed above my troops. From left to right these are Orbital Strike, Beacon, Bloodlust, Deathstorm and Haywire. The tactics get more expensive when used in succession. Since I get more power points I get to either weaken the turrets with initial strikes or can use the beacon more to direct my troops. … but victory is mine in the end. For achieving the bonus (a different screen from a different battle here) I get to have extra resources. After the battle the area turns into a conquered space. Here’s a look at the base of an actual player. A successful attack on them, especially if they’re not protected with a vault, can result in outrageous rewards. Each battle awards honor points in addition to resources, which gets you a rank of sorts in Chapter gameplay. Cha-ching! That munitions reward will work well to replenish my forces AND will serve with the research costs. 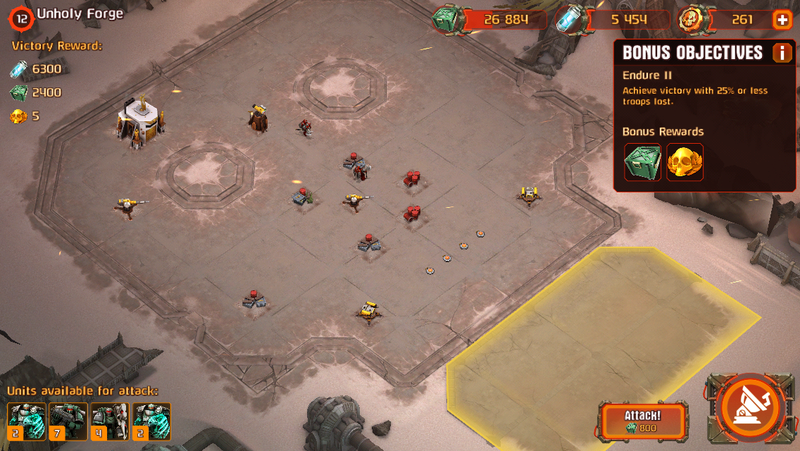 The units, mines and the tactics used in the battles can be upgraded through the Research building. Successive upgrades cost a lot more each time. Upgrading the tactics is a good idea to get the upper hand. And yes, that’s a Reaver titan in the far right… you can summon it at later levels! 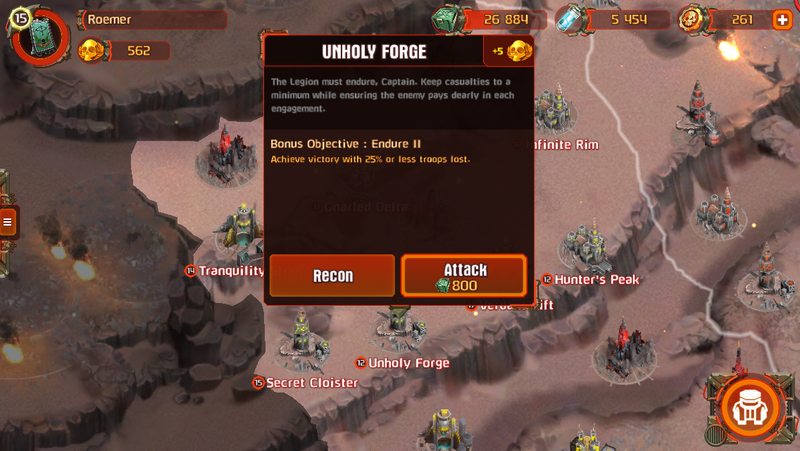 Battles with players and in outposts also provide tech shards that can be combined into Relics. The Forge provides this service, the better the shard quality, the better chance to get a rare Relic. Upgrading the Forge allows storage of more Relics in the inventory. You can use Lesser, Greater and Flawless tech shards. Let’s forge one using 8 Greater shards. You can get a random Relic or pick your category in return for Machine Spirits. Sweet! I got an uncommon Relic that boosts resource production. I can trade in the common Relic in place of the new, uncommon Relic. I also have a rare Relic for use in battles. That Terminator bonus served me quite well. Relics can be displayed on a pedestal to “activate” them. In peace time it makes sense to focus on resource Relics. Lastly, there is a guild feature to connect with other players of your allegiance and participate in world-wide events but I think so far this part is just developing. You have to spend 20k power to build the Chapter HQ (hefty for the beginning) to activate this, then pick a chapter to participate in. Some chapters may have honor requirements. Build the expensive Chapter HQ to look for Chapters. I have joined a relatively high honor Chapter with openings, we’ll see how it goes. As a closing point, here’s a list of stuff I found out through game play that works nicely. Try to upgrade your Power Generator as soon as you get the HQ upgrade requirements. Power comes from only one source outside of combat, you better upgrade it to earn more. It seems that currently you get an abundance of enemy spawns on the map, so Power and Munitions are hardly an issue. Once you open up 1-2 additional regions expect to have full Power and Munitions at all times. Make sure to juggle the resources between play times. This means staying below Vault protection cap between gaming sessions. If you raid a player, cap your resources and cannot spend them, you’ll be open to counterattacks and theft of your treasures. I have upgraded the vault to the max until I got frustrated with it: the steal mechanics don’t work. Yes, you can still steal outrageous amounts of Power and Munitions from other players but it appears the vault does not protect you AT ALL. It seems that with the last update the mechanics of the Vault are fixed. The timing of resources and protecting your goodies is back online! Double-check your troops before going into battle. You don’t want to have a ragtag team before launching your assault. Also double-check your Relic before the battle. Switch to a combat Relic and think of resources later. The classic tank-DPS tactic works here too. Send in your Terminators or other armored units first to soak damage and support them with the hitters, your Space Marine Squads and Devastators. Terminators, aside from looking badass during a fight with their lightning talons, are great tanks for the beginning. Your units seek out the closest target upon entry into the field. Use this feature carefully, especially when attacking an enemy player. The soldiers tend to get trigger happy and fire at insignificant targets. Watch them or lose them. Beacon is outright the BEST tactic to invest in, especially in the beginning. Whenever you get the chance, upgrade this first. It will give you unparalleled advantage in re-routing your troops around turrets, mines and useless rubble. I won numerous battles without even getting a dent from the base defenses through Beacon. Resources: You may want to save on Power and Munitions in the mid-game to time your upgrades. Don’t. Instead keep your Mechanicum Adepts working on buildings and upgrade your tactics and troops 24/7. Speaking of servitors, the game literally throws Machine Spirit (MS) at you once you hit some of the larger milestones like area control and conquest so unless you’re really impatient use this opportunity to secure more Adepts. You can work with 3 Mechanicum Adepts maximum. After that use MS to rush projects. Base improvements: Upgrade the HQ first and foremost whenever you can, and if you’re a paying player, rush this project first. Then comes the Logistics building to open up map areas. You’ll want to access as much of the map as possible early to acquire Servitors on the map and get the shiny Machine Spirits. Next up improve your Rally Zones to lvl9 if possible. That will get you 4 Terminators and 4-5 Support per zone. Plenty to work with early on. Next upgrade your Research building to spend Munitions on upgrades. Go from there. Combat tactics: Upgrade them as soon as they’re available for upgrades. Resources are not as scarce as you think and you can afford the millions for that additional energy cost decrease for Beacon and Orbital Strike. 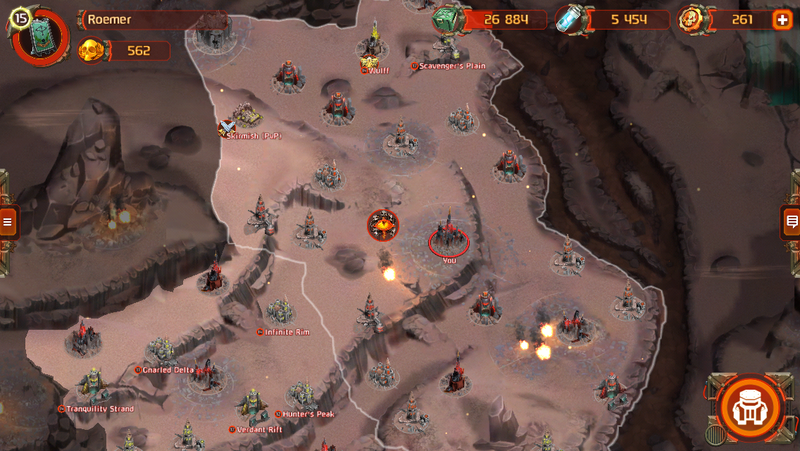 Useful tactics for base and AI attacks: Orbital Strike, Beacon, Haywire, Dominate and Reaver Titan in the late game. Ignore all others. Deathstorm looks cool but is absolutely terrible. Use Haywire to shut down closely placed turrets. Unit composition: Once you reach Raptors (I believe it is HQ lvl12 or 13) keep 1-2 teams of Terminators (upgrade their rally points to have 4 or even 5 of them per team) and go with Raptors for all other rally zones, which should net you 4-5 Raptor gunships. They’re very powerful and the only things that can hit them are Whirlwinds and Hunter missile batteries. Take them out with orbital strikes and steamroll the enemy base with impunity. Before you unlock raptors keep a healthy mix of infantry (Support and Marines) for areas riddled with Lasers. For Beamer-filled missions try to separate your tanks and support to avoid a massacre. Did I say Beacon is your friend? Do not employ the Dreadnought (once available) for Single Player. Its attacks are geared towards countering Raptors and Terminators in Skirmish and is sub-par both as tank and DPS. Skirmish: Currently the matchmaking is terrible. Regardless of your rank you’ll meet people who are rank 2o (lowest) for you to farm. Early on you can mop up most players by a 50/50 composition of Terminators and your favorite damage dealers (Jetbikes and Support are great), later when you meet enemies that can bite back use Dreadnoughts and Terminators as well as some DPS. Remember that Raptors are very fragile in PVP and cannot cap points. Early on rush for the middle and hold. The “attack closest enemy” mechanic will allow your enemy to stop capping and come to you. 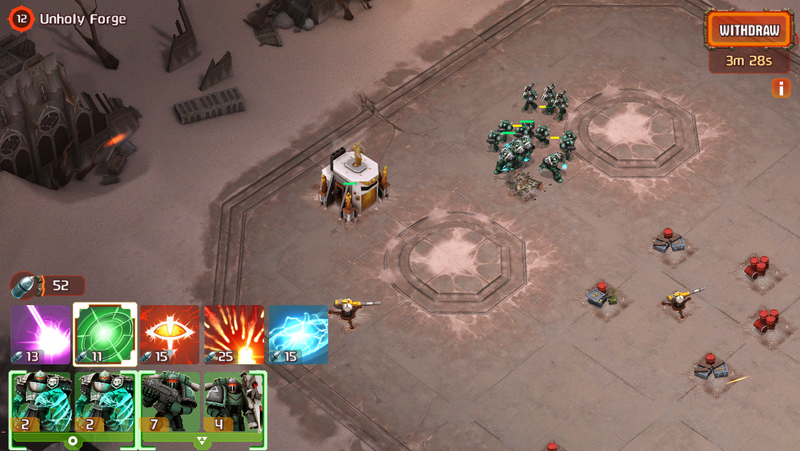 Use Haywire on enemy groups to either incapacitate while your Terminators rip them apart or to separate them. In later stages it may be a good idea to divide depending on your opponent’s placement. Still working on a good overall strategy as of writing this. Relics: Once you get high ranks in Skirmish you’ll be showered with Relic fragments. Use these to forge nice relics. Early on the best ones improve your combat abilities: +damage to Support, +health to Terminators, +combat energy and +1 sec to combat tactics are great. Additional rewards and resource production bonuses sound nice but are unnecessary. Keep in mind that bonuses do not stack: try to spread your attributes as much as possible. Chapter: While movement speed and extra damage or health are pretty sweet, the real game changer is combat energy, which means the Sons of Horus is a very good chapter to play and stick to. The Reaver Titan in the current version is unstoppable. Seriously, once you unlock it there’s nothing that can stand in your way. You’ll be able to clear areas that are 10+ levels above your level. Fire it on anti-air defenses and watch as the Apocalypse missiles tear your enemies apart, then laugh at them as the Laser Blaster shoots everything to oblivion. If there is still enemies standing, bring in your Raptors to mop up. A relic I had the honor of forging. Fitting for the Sons of Horus huh? Sadly I lost it due to a bug of sorts. Horus Heresy has Contemptors. They look awesome but work very little in single player. Looks like someone is raiding my base. Same applies to attacking an enemy that is online: you cannot attack them. Once the zones upgrade to lvl10, they grow in size. This is from the time when I was still using Support for DPS. I think this is at the end of the 6th mission in the SP campaign. Get there as soon as you can, abuse the Reaver before it gets nerfed. Glaive tanks come a bit late in the game (post Titan I mean, which makes all other units obsolete). I’m still waiting for my Rally Zones to upgrade to see it perform. Oh my! Those lasers would have torn me to shreds if I didn’t have air superiority. Another mission with a Beamer. They used the Aquila Strongpoint for the skin! Sweet. An unfortunate enemy getting obliterated by the Reaver. Even if you don’t expect a titan attack, don’t deploy this close as the enemy can hit multiple buildings with Orbital Strikes. With air defenses gone this will be easy pickings. I think I looted around 1million in both Power and Munitions. Hope you enjoyed the review and see you on the next post! Looks like a quality game, but I bet its really addictive ? It’s pretty much Clash of Clans in WH30k, but that doesn’t really take away from the atmosphere. It feels good to crush some loyalist scum under the iron heels of the Sons of Horus! No problem. Hope you enjoy the game as I did!